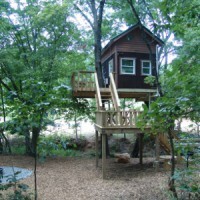 Timber Ridge Outpost & Cabins is a unique Treehouse and Log Cabin Resort located in the amazing Shawnee National Forest of Illinois. A unique experience for families, honeymooners, horseback riders, hunters, fisherman, hikers, bicyclists, bird watchers and star gazers. Nestled in the beautiful hills of the Shawnee National Forest, Timber Ridge Outpost & Cabins offers something for everyone. Spend your days enjoying the many wonders of the Shawnee National Forest at such famous places as The Garden of the Gods, Cave In Rock, The Iron Furnace and One Horse Gap Lake. For the Sportsman in the crowd, Hardin County offers the finest Whitetail Deer and Turkey hunting in the country. The 75 miles of the Smithland Poole on the great Ohio river, is host to numerous fishing competitions throughout the season.